FED/Zorki shutter: How does it work, and why the strange number sequence? The basic shutter design of the FED and Zorki 35mm cameras was copied closely from the Leica II. In this design, the shutter speed dial rotates with the first curtain, and a pin on the shutter speed dial trips a lever which releases the second curtain. The shutter speed setting is changed by lifting the dial and rotating it, thus moving the pin so that the first curtain will travel a longer or shorter distance and time before the second curtain is released. Because the speed of the curtains and the dial is essentially constant, but the difference between shutter speeds is not (each speed being double the next in a normal progression), the high speeds are grouped very closely together on the dial while there is a great distance between the two slowest speeds (typically 1/60 and 1/30 second). In this type of shutter, typically, it takes about 1/30 of a second for the first curtain to complete its travel and come to a stop. In order to add “slow speeds”, ie, those below about 1/30 second which require the second curtain to remain stationary for some time after the first curtain completes its travel, Leica introduced in the Model III a fairly complex linkage involving an escapement assembly located in the bottom of the camera and a separate slow-speed selector dial on the front. The function of this mechanism is to catch the second curtain as it begins to move, hold it for a preset length of time, and then let it go. 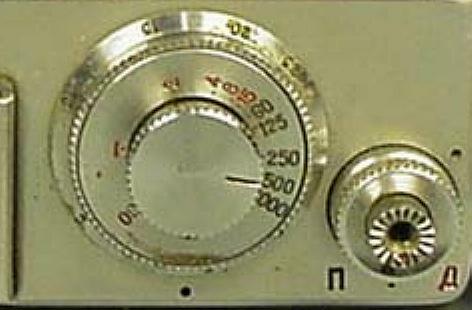 When the time came for the Russian designers to incorporate the same capability, they noticed the big empty space between 30 and 60 on the shutter speed dial and decided that they could stick the slow speeds into that space instead of requiring a separate dial for them. If you ignore the slow speeds (1 – 1/15) when looking at the shutter speed dial of a FED or Zorki, you’ll see that all of the other numbers, and the “B” setting, are right where you’d see them on a screw mount Leica. (Well, they bunched the 60 a little closer to the 125 to make more room for the slow speeds… we’ll get to that)…. So how did they make all this work? You may notice that, as you wind the shutter, the shutter speed dial rotates… and that changing shutter speeds from a faster to a slower speed involves rotating the dial in the same direction that it turns during winding. So, winding the shutter is basically the same action as setting it to a slower speed. By placing the speed delay in between 60 and 30 on the dial, the slow speed delay device is engaged as the dial passes the 1/60 point… whether this is the result of setting a slower speed, or of winding the shutter for the next shot. The farther past this point the dial turns, the farther the slow speed device is engaged and the longer the delay will be on the way back. The shortest distance is the 1/15 setting, then 1/8, etc, on to one second when the delay device is fully engaged. As was the case with the higher speeds, you notice that the space between numbers increases as the speeds get slower: there’s more time (hence more space) between ½ and 1 second than there is between ¼ and ½ second. Now, as the shutter is released, the first curtain begins to travel, and once it’s gone for about 1/60 second (actually it’s less than that, closer to 1/100… we’ll get to that too), it has not gone nearly all the way across the film yet but it hits the tripper to release the second curtain. The second curtain can’t move yet though, because it’s all bogged down in the clockwork of the delay device, so it sits there buzzing the gears as the first curtain completes its travel, and then it keeps buzzing them for however long… 1/15, 1/8, whatever it was set to…. until it comes free of the clockwork and follows the first curtain across. If the shutter speed dial is set at the same place, it will wind up the clockwork the same way as the film is wound for the next shot. 1. Why is the 60 so close to the 125? And why does the second curtain get released after only 1/100 second at slow speed settings? I told you we’d get to that. In order to make more room on the dial for the slow speeds, the camera is designed to engage the slow speed timer in LESS than 1/60 second, which introduces the delay mechanism into the 1/60 second speed as well as 1/15 through one second. As a result, 1/60 second is actually a “slow” speed, while 1/30 second is a “fast” speed. This moves the 60 on the dial to the position where 100 would have been in a normal progression, leaving a bigger space between it and 30 to fit all of the slow speeds. 2. Why is the 30 way at the other end of the dial past the 1000? And why is B in between 1000 and 30? Actually, the 30 is right where you’d expect it to be in relation to the other speeds on the dial. But if you tried to get to it by turning the dial from 60, you’d have to plow through the slow-speed timer to get there… thereby getting something longer than one second, rather than 1/30. So, to get to the same place without going through the slow speed system, the dial is arranged so that you reach that position from the opposite direction. In this position, when the first curtain travels, the pin doesn’t reach the second curtain tripper until the shutter is all the way open – a full 1/30 second. Since you didn’t engage the slow speed gears in setting the 1/30 speed, they aren’t there to slow things down on the return stroke… it behaves, therefore, exactly as if the slow speed mechanism weren't there at all. Thus 1/30 second is the slowest of the “fast” speeds, and 1/60 is the fastest of the “slow” speeds… an arrangement found nowhere outside of Russia that I’m aware of, but it does work. Now for the “B” setting: what’s it doing tucked in between 1/30 and 1/1000? Well, actually, from the shutter’s point of view, it isn’t. Like the 1/30 position, the “B” position is basically in the same place as it’s found in the Leica: just beyond the slowest speed on the dial. 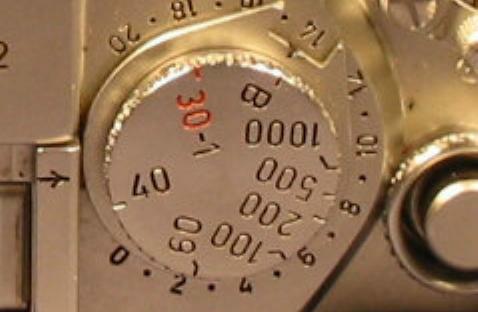 By placing the tripper pin beyond the slowest speed setting, the first curtain (and the shutter speed dial attached to it) comes to a stop before the pin ever reaches the tripper for the second curtain, and so the closing curtain isn’t released at all. It stays stationary until the shutter release is let go… this, on its way back up, will engage the tripper for the second curtain and let the shutter close. The reason that “B” is reached from the fast end of the scale is the same as the explanation for the 1/30 setting: in order to avoid charging the slow speed mechanism unnecessarily for a setting that doesn’t need or want it. 3. Why is it so important not to set the shutter speed before cocking the shutter in a Zorki or a FED? First, let’s remember that you can’t set the shutter speed before cocking the shutter anyway in this type of shutter, whether it’s in a Zorki or a Leica: the dial spins during exposure and it stops in a different position from where it started, so there’s no relationship between the indicated speed and the actual speed unless the shutter is cocked. But doing this in a Leica (or in a FED or Zorki model that doesn’t have slow shutter speeds) will only give you an incorrect speed setting; it won’t cause any damage. You’ll remember that winding the shutter performs the same action on the speed setting mechanism as rotating the speed dial to select a slower speed. Now suppose you’ve already selected a slow speed, say 1/2 second, and fired the shutter…. now, in the released position, the shutter speed dial is pointing to the 1/30 position instead of 1/2. And suppose, forgetting the rules, you now change the setting so it points to 1/2 with the shutter uncocked. In doing this, you’ve wound up the slow speed mechanism to the 1/2 second position, which is nearly to the end of its range. If you now proceed to wind the film advance, the camera is going to try to rotate the shutter speed dial another 300 degrees, but the end of the delay mechanism’s range will be reached after the first 45 degrees or so of movement. At this point there are two possibilities: either you stop winding in mid-stroke, or the shutter breaks. Having said all that, I’d like to mention here that I think the fear of this damage may be a little bit overplayed: I have tried to commit this error with both my FED 3 and my Zorki 4, and I found it couldn’t be done: it was possible to turn the dial to a position beyond its range, but it wouldn’t drop into place anywhere beyond the correct position for a 1 second speed. I won’t say there are no Russian rangefinders that could be damaged in this way, because the rumors are too plentiful to be unfounded, and it certainly is theoretically possible; but in my particular cameras, the design of the shutter system does not appear to permit the shutter to be damaged by setting the speed before cocking. The most it will do, like the Leica, is deliver a different speed from the one I thought I was setting. Overall, for all its little quirks and foibles, I think I prefer the FED/Zorki single-dial design over the two-dial system in the screwmount Leica series: beyond the convenience of a single dial, it seems to be more robust and require less frequent cleaning and adjustment to stay in trim.